It is no secret to anyone who reads this column that Fluffy and I watch our share of television, and one of our favorite “guilty pleasure” shows of this summer has been "Naked and Afraid XL." We assume that "XL" means extra-large, but that is being optimistic. For one thing, all of the naked people have their naughty parts pixilated, so we have no idea who is extra-large versus average. And for another thing, after being in the wilderness for forty days without food, nobody on that show is going to be extra-large, even if they started out that way. But I'm getting ahead of myself. "Naked and Afraid XL" is a survival show, where twelve people were divided into groups of three and dropped into a particularly nasty area of the Colombian jungle, where they were left to fend for themselves for forty days. And each individual was given one other item of his or her choice. Some chose a machete or a knife. Some chose a pot. One chose mosquito netting. Whatever one survival tool he or she wanted, he could take. Each group also had a rough map. It showed approximately where they had been dropped off, and where they needed to be in forty days' time to get picked up. In every case, they were at least five or six miles from where they needed to be. In between them and their extraction point was the mighty Orinoco River, which was teeming with snakes, piranha, caiman and other predatory creatures. That was all the naked people were given. There were no shoes to protect the bottoms of their feet. There were no clothes to protect them from bug bites. There were no fans to cool them in the 100+ degree heat. There were not even shoelaces to use as cordage. Whatever else they needed, for forty days, they had to get from the jungle. Period. Each group of three survivalists knew there were other naked people out there somewhere, and they all knew where they had to be in forty days' time. But none of them had any particular requirement to meet up with one another, or live as a group together. They just needed to survive, in whatever way seemed best to them. Fluffy and I immediately started following a group that called themselves the Alpha Males. They were aptly named. One of them did not do well and quit the challenge in only the second episode because of health issues, but the other two were as strong as lions. Jeff Zausch, just another basic Mormon. 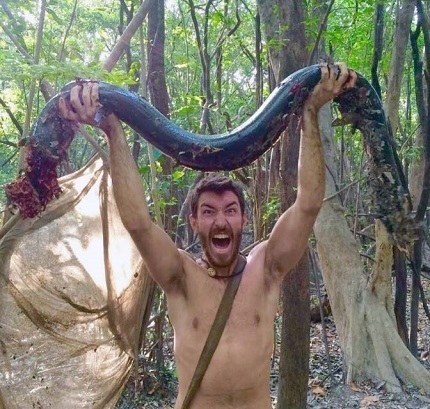 We who watched "Naked and Afraid XL" are well aware that this triumphant picture of Jeff bagging his third electric eel actually went all the way down to his feet. Thank goodness for the art of pixilization! As the series progressed, different groups of survivalists chose different ways to survive. The Alpha Males went out hunting every morning, staying out until after sunset, and choosing to subdue the land and kill and eat whatever they could. There were actually a couple of vegetarians in other groups, though, and one of them made it all the way to the end without eating meat. Contrary to the Alpha Males, most of the other survivalists were dominated by the philosophies of some loud, domineering, and, as far as Fluffy and I were concerned, stupid women who decided that the best way to survive for forty days was to lie on their rear ends and to do nothing whatsoever in the way of work. This is not to say they did nothing at all, however. They decided they were going to criticize whatever anyone else did in the way of work. It went way beyond nagging. "Bullying" is a word that is way overused these days, but these survivalists did it, choosing two members of the group who were at the bottom of the pecking order and then picking on them until they chose to “tap out” (go home) rather than stay and endure the torments of their peers. These weren't fifth graders. They were adults. This was a social experiment that sociologists should study and write books about. These survivalists systematically chose two people, excluded them, and drove them out of the tribe. If there had not been producers there to take them home, they would have died in the wilderness. Eventually all of the naked survivalists found themselves in the same area, Piranha Lake. The team of Alpha Males decided, wisely, to stay away from the rest. Perhaps they didn’t stay far enough, because every time the Alpha Males caught an electric eel, the other people arrived with their hands out, ready to eat. To their credit, the Alpha Males would usually share their catch, even though the sharing was not reciprocal on the rare occasions the other team found meat. The other team would not have survived without the food the Alpha Males gave them. But after the challenge was over, the rest of the group sniped that they didn't really need the food the Alpha Males gave them. They would have made it anyway, they said. As we watched this show, we saw two kinds of people. We saw people who were builders. They got up in the morning and worked toward feeding themselves and having a productive life. When they found food for themselves, they even fed others. You may even say they fed their enemies. They certainly weren't feeding people who were being kind to them. The other people were people who were lazy. They didn't do anything but lie around from morning till night. They said they were "conserving their resources," but they certainly worked overtime in looking for evil things to say about the people around them. And their feet ran to the food that was produced by others. They always had a hand out to take a share of the resources that they had no hand in procuring. The older I get, the less I am physically able to do. Frankly, my ineptitude drives me crazy. But I hope that I am always able to do what I can do, and to accept what others do for me, with a happy heart. The least I can do is to offer a word of encouragement, and a smile, along with what little help to others that can give. If the day comes that I stop trying to do something productive, I will feel so guilty that I will probably curl up in a ball and die. And if I ever become a sniper who preys upon the goodwill and the tender feelings of others, I will have lived too long upon this earth.